Pelican Beach Resort 1105 is professionally managed by ResortQuest by Wyndham Vacation Rentals. ResortQuest offers Pelican Beach Resort 1105 in beautiful Destin. 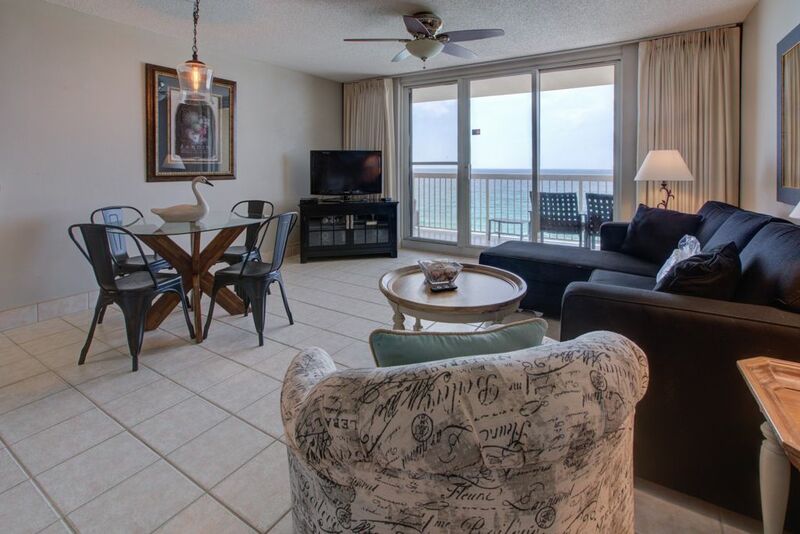 This 1 bedroom, 2 bath unit located on the 11th floor, offers fabulous views of the Gulf of Mexico. This unit has a king, bunks, and a sofa bed and sleeps 6. With 2 TVs, 2 DVD players, and CD stereo system, you will enjoy all the comforts of home. Enjoy your vacation with this awesome view of the gulf. The condo is comfortable and well maintained with upgraded furniture, carpet, tile and electronics. A great place to watch the dolphins play in the gulf or enjoy the 32" flat screen in the living room and bedroom. Room was updated, clean, and an amazing view! Resort has cafe and tiki hut on site. Two pools and a hot tub. Our kids loved everything, including their own little bunk bed area. Kinsey, we are so happy to hear you enjoyed your stay at Pelican Beach Resort! Your guest experience is our top priority. Thank you for taking the time to write a review about your vacation after you returned home. We hope you are able to visit again soon.